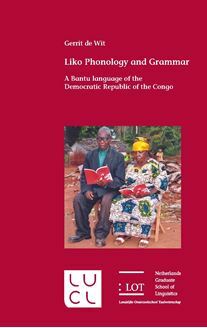 This thesis presents a detailed description of the phonology, the tone system and the grammar of Liko, a Bantu language spoken by about 70,000 people in the northeastern part of the Democratic Republic of the Congo. It provides numerous examples. Liko has a nine-vowel system with ATR contrast in the mid and high vowels. Its pervasive vowel-harmony system is [+ATR] dominant, but there are dominant verbal and nominal [−ATR] enclitics which influence preceding [+ATR] non-high vowels. Liko is a tone language with both lexical and grammatical tone contrasts, depressor consonants and automatic as well as non-automatic downstep. Liko is one of the "Northern Bantu Borderland" languages. The Bantu noun-class and agreement system is present to a large extent. Nevertheless, subject agreement is limited in verbal morphology, and object agreement is obligatory for first and second persons and class 1 and 2 objects only. The Liko verbal system is complex. To encode Tense/Aspect/Mood, the language uses segmental morphemes, tone melodies as well as time adverbials. Tone and vowel-harmony rules determine the surface realization of the verb form. Topics in syntax include: verb valency and object agreement, word order, relative clauses, complex sentences and information structure, including an analysis of focus marking. Liko is a language with strict SVO word order. Relativization and left-dislocation reveal a syntactic means to differentiate between objects and adjuncts in this language. The two appendices contain ten texts as well as verb paradigms.